Farhad Mehr joined Francis Lawyers in 2013. As a litigator, Farhad prides himself on the results he provides to clients. His varied and wide-ranging practice includes civil, construction liens, commercial/franchise, estate, and family litigation. Farhad has appeared before the Ontario Superior Court (Civil, Family, and Small Claims branches), the Landlord and Tenant Board, the Criminal Injury Compensation Board, the Labour Relations Board and the Ontario Health Services Review Board. Among a wide variety of small and large business owners, he represents several franchisors and franchisees in a wide-range of corporate litigation, and commercial landlord and tenant disputes. He also assists clients in corporate restructuring. Farhad works in tandem with an external team of tax specialists, to protect his clients and their investments. He also represents contractors and property owners in construction lien matters. In his estate litigation practice, Farhad represents clients in proceedings on issues related to powers of attorney, passing of accounts, wills challenges, guardianship applications, and all other estate litigation matters. 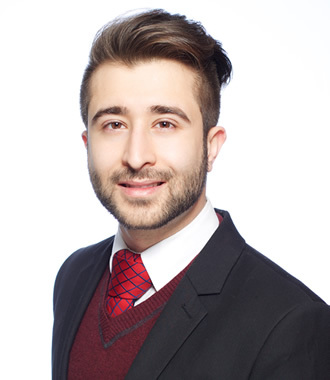 Farhad also represents family law clients in disputes regarding custody and access, child and spousal support, as well as division and equalization of family property. Farhad graduated from the University of Ottawa, Faculty of Law with a combined degree in Civil and Common Law. Farhad also completed his Certificate in Arbitration from Penn State Law (The Dickinson School of Law) in conjunction with McGill University. When not in the office, Farhad is passionate about travelling and exploring new cultures. In his little free time from the office, he enjoys playing table tennis and rugby. But not at the same time.